I really can’t wait to see our beloved hero, Margaret Thatcher. And it definitely looks like Meryl Streep has done her justice, and more. The trailer looks awesome. 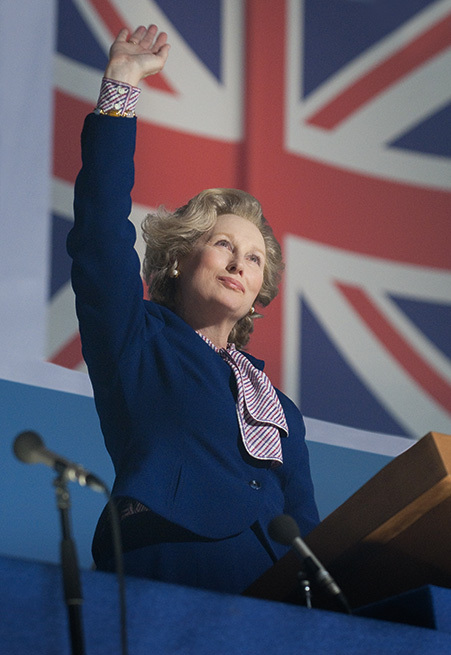 Oh my my… Here’s the official Iron Lady movie site. Here is a short version of the speech President Obama’s, in which he announces the death of Terrorist Osama Bin Laden. I really liked what President Obama said about Islam, starting from 2:30. It’s very good of him to remind Americans that the US is not at war with Islam, nor is Bin Laden an Islamic leader. ينطلق عشية يوم الأربعاء 13-4-2011، في الرياض حفل افتتاح المهرجان الوطني السادس عشر للتراث والثقافة السعودي، الذي يُعنى بإبراز الموروث الثقافي والحضاري للمملكة العربية السعودية، برعاية خادم الحرمين الشريفين، وتنظيم الحرس الوطني السعودي. 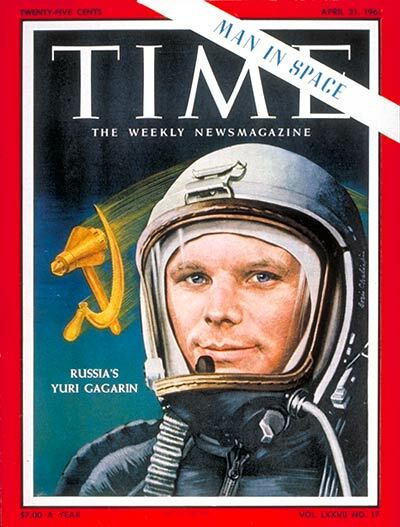 The Russian Yuri Gagarian was the first human to travel to space, and it happened on April 12th 1961. This is the link to Time magazine cover story on Gagarian, published 9 days after his historic flight. It makes me wish I lived during those historic 60’s. From Leningrad to Petropavlovsk, the U.S.S.R. came to a halt. Streetcars and buses stopped so that passengers could listen to loudspeakers in public squares. Factory workers shut off their machines; shopgirls quit their counters. Schoolkids turned eagerly from the day’s lessons. Somewhere above them, a Soviet citizen was arcing past the stars, whirling about the earth at 18,000 miles an hour, soaring into history as the first man in space. 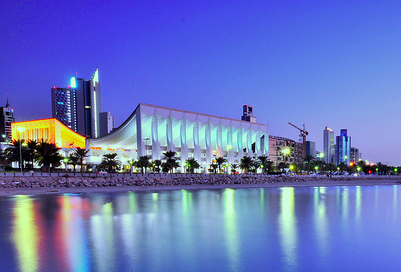 Last year, it was announced that Kuwait was planning on establishing an Opera house, with a an area of 50,000 sq meters. Today’s papers have finally given us the location of this beacon of music, which will be called Sh. Jaber Al-Ahmad complex. It’s going to be on Gulf Road, between Al-Salam Palace and Flag Sq. (Sa7at Al-A3alam). I don’t know if this location is ideal, in terms of traffic and more importantly from a scenery and architecture point of view. I feel it should be located in a strategic place, like that of the Sydney Opera House, where people from far away can see and appreciate it. 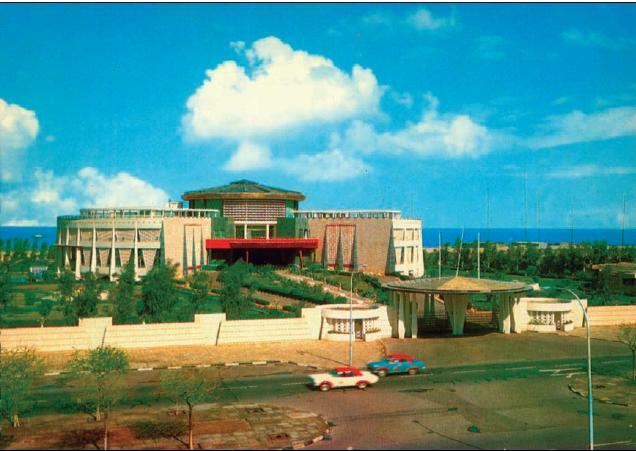 However, I love Al-Salam Palace, and hate how it’s all ruined now. Maybe having the Opera House beside it will make the government finally remodel and renovate this beautiful palace. I couldn’t find any drawings of the new Opera House, so I used pictures of beautiful Kuwaiti buildings instead. I chose one from our past (Salam Palace) and one newer (Majlis Al-Omma). And I also found this cool site that has lots of old Kuwaiti pictures. Browse through SkyScraperCity if you like to see more of Kuwait’s beautiful 50’s & 60’s architecture. The link to the full article is here. I didn’t go to today’s gathering since I’m not that convinced of the demands made there. I agree that Sh. Naser has performed very badly, made many enemies, and that his job now is that more difficult to do considering his many and multiple opposers. That being said, I have followed the gathering on Mubasher TV Channel, and I’m vey impressed with what’s being said, the people there, and the many public figures that went there in support of the protestors demands. Sh. Naser used to be a very respectable member of the ruling family. But his performance as a PM has been very poor. He has been accused of paying unexplainable amounts (some of which was public money) to public figures, without justifiable reasons. His handeling of many conflicts is both shortsighted and contradictive (like the removal of the Kerby mosques). Allowing someone to be tortured to death in his government was totally unacceptable. 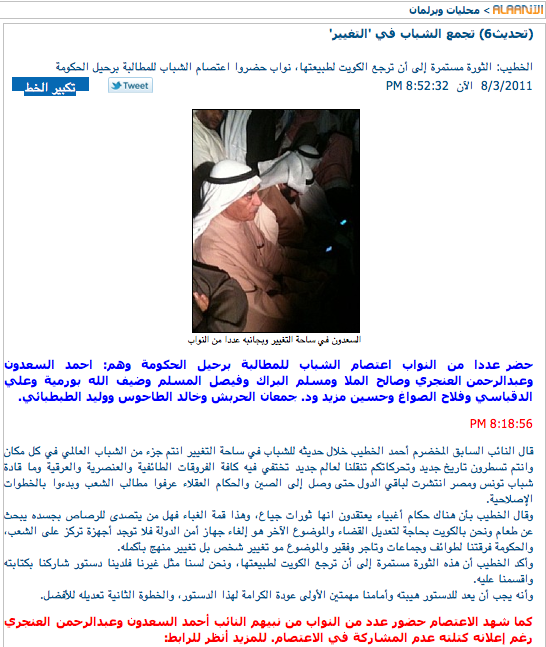 The use of force against unarmed people and against high profile characters like Dr. Al-Wasmi was unprecedented. The use of force and the beatings of Members of Parliament is unforgivable. He broke Kuwait’s long time reputation of not having political or free speech prisoners. The continued internal struggle between him and Sh. Ahmad Al-Fahad has only weakened his position as someone who’s deserving of the PM post. The amount of corruption in Kuwait has reached the max, with no development of any level in his years of governing. For all this, we deserve a better PM. There I’ve said it. I tried hard not to get sucked into this protest thing, but still. One might reach a limit where they’re forced to voice their opinion.